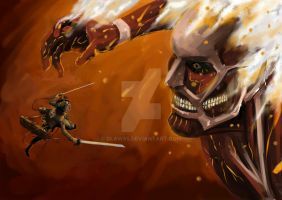 Wow, at last one Colossal Titan that's correctly proportioned... Most artists simply draw him like a skinless, muscular man, but you really got his appearance right, with his bulky body and tiny arms and head. Not only that, you got him to do a really dynamic pose, and that's most welcome. Thank you. I love your fan art!